This post was originally published on August 18, 2013, but it's such a popular post this time of year I'm bumping it up so that those of you looking for ways to use up your squash leaves can find some suggestions. Don't forget to check the comments section, as tons of people have been kind enough to share their wonderful recipes from around the world!! 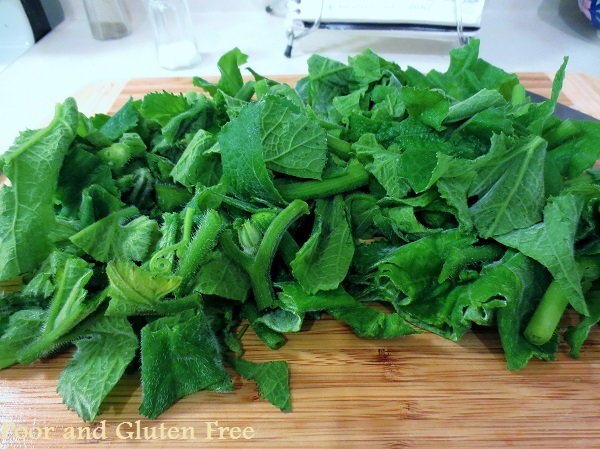 Ever wondered if can you eat squash leaves? I noticed these big buckets of fuzzy, curly, decorative squash greens for the first time a while back at the farmers market. We eat a ton of greens, but I’ve never grown squash so it just never occurred to me to question if squash leaves are edible. I asked the older Hmong lady selling them what to do with the squash leaves. She told me to peel the fuzzy skin off and boil them. This was rather vague, so as soon as I got my bunch home I scoured forums and blogs and found squash leaf recipes ranging from Hmong to Thai to Nigerian to Italian. I’ve shared 9 different ways I found to make use of squash leaves and stems, as well as some tips for prepping and using them. So if you have pumpkins, zucchini or other squash spreading in your back yard, or you see a bunch of them at your farmers market, go buck wild with these ideas! 1) Simmer in broth like soup. 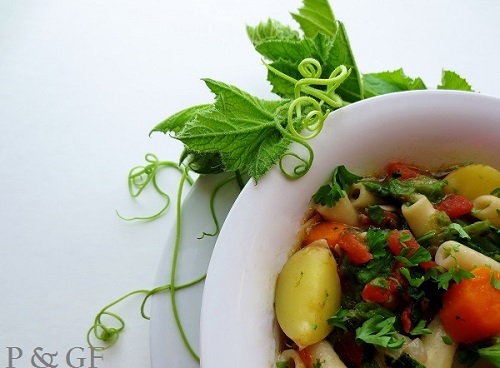 In fact, in Italy they call the leaves TENERUMI, and there’s a popular soup made out of it. I’ve actually made a version of it myself that I’ve included in my upcoming OAS Cookbook. It includes greens, noodles, carrots, baby potatoes and seasonings. 2) Sauté in oil or butter with a little bit of garlic and lemon juice, salt and pepper, serve on rice or as a side. 3) Sauté in a bit of fat, oil or butter and serve with chicken and rice. 5) Cook squash leaves in plain coconut milk (Thai style). Here’s a basic recipe for this. 9) Or, sauté with onion, garlic oil, turmeric and red chili powder and cook for about 10 min. Add shrimp, potatoes, tomatoes, or other veggies. 10) Bonus! I assume that you can use these greens in most other recipes that call for steamed, sauteed, or cooked greens. Squash leaves are best used fresh. I've found that storing them in a container of water in the fridge with a plastic bag wrapped over them is the best way to keep them fresh for a couple of days. I've tried storing them without water in the fridge and in water out of the fridge and found they wilt quickly, so in water, covered with a bag, in the fridge seems best. Some recipes call for you to peel the scratchy skin off the stems. Others don’t, and indicate that long cooking times break down the skin. I don’t peel mine (seriously, who has the time?!) and it turns out totally fine. 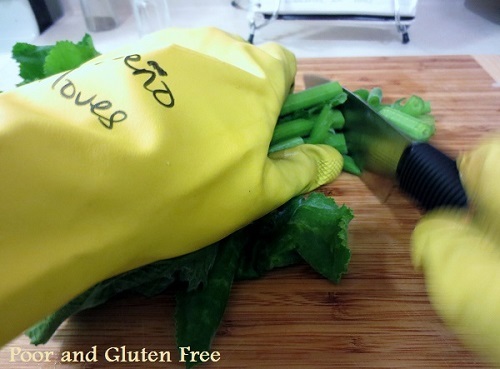 Wear gloves if your skin is at all sensitive. Yup. These babies can be itchy, particularly if you happen to have oral allergy syndrome and react when certain fruits and veggies touch your skin. I carried my bunch of squash leaves home from the farmers market in a bag over my shoulder, and they brushed against my arm along the way. 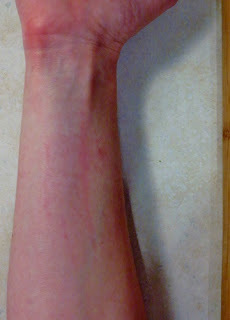 When I got home my forearm was on fire and I wanted to peel my own skin off, never mind peeling the squash stems. 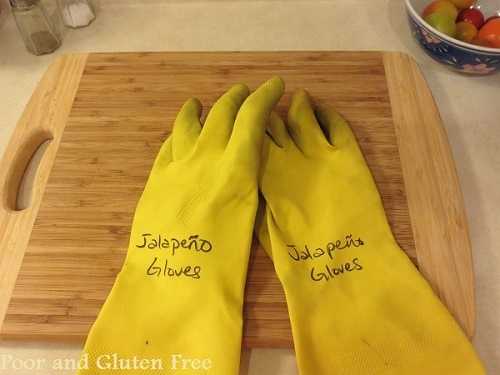 I pulled out the gloves I normally reserve for cutting jalapeno peppers and wore those to protect my hands and forearms. The stems can be a little tough, depending on how long they are. Trim off an inch or two from the bottom to get to the more tender stalks. Wash thoroughly in a colander. If desired, remove prickly skin from stems using a paring knife or peeler (again, I didn’t and found that my long cooking time was enough to get rid of any prickles, but you can if you want). Chop both leaves and stems into 1-2” chunks. 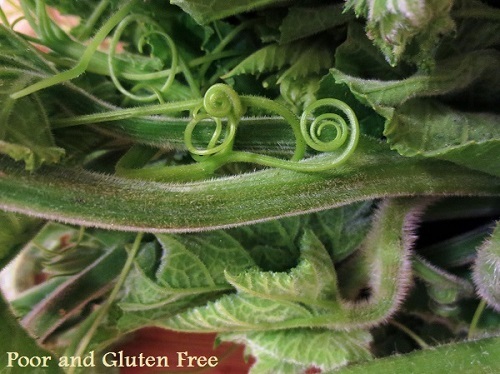 Take photographs of the adorable curly vines that grow from the stems. Have YOU ever had squash leaves? If so, I’d love to hear how you eat them! If you cut onions and garlic and let them sit in water and infuse in your refridgerator, then strain it, you can put it in your bug sprayer container and spray your plants. Bugs hate it and steer clear of the smell. Don't water your squash very long...hand watering is fine. Depending on temperature outside you may need to hand water more often for hot days and less for cooler days. This kind of watering instead of the sprinkler or irrigation prevents white spots on the leaves. When the early light frost kills the leaves you can still harvest the stems and use them for food. If you put a tent of 6mil plastic over your squash plants you can prolong their life and get more harvest. Oh, that sounds like a great tip, thanks for sharing! I've heard that garlic scattered around plants helps keep bugs away, but spraying makes more sense for plants with a lot of leaves. Wow! I had no idea those tough, prickly leaves could be made edible! We have a squash plant that grew in our front yard, apparently from a seed that was in our compost. It is making one squash (looks like an acorn squash) so I don't want to cut its leaves off now, but I'll try one of these ideas later in the season. I'm pinning this! I found your blog through the Hearth & Soul Hop this week. Hi Aurelia, thanks for stopping by! I don't know if others will have the same problem with the stems being itchy, I'm just really sensitive and things like geranium and ivy leaves (and now, apparently squash leaves!) really set my skin on fire! This is great. We got carried away with squash plants this year and have loads of squash leaves, so I will have to give it a go! I didn't know you could eat squash leaves! The look so pretty! (Thank you for the warning about how they can affect your skin though.) This is a great post, with lots of wonderful recipe ideas. Thank you for sharing it with the Hearth and Soul hop. 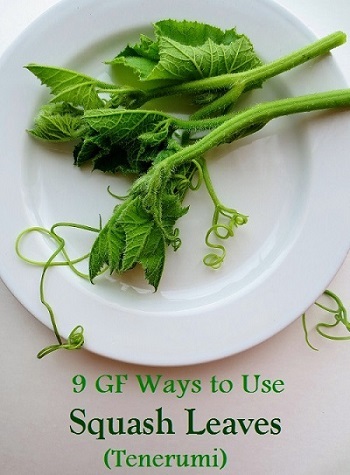 When I first saw the post on the Fabulously Frugal linky, I thought you typed in spinach, and then realized you wrote squash. I am a bit curious though since squash vines make me a bit itchy, I would worry about how my body would react. Eating squash and gourd leaves is common in South Asia... it tastes great sauteed with onion, garlic and green chillies. That sounds nice and simple, thanks for sharing! Love the info, super happy finding this. I eat squash blossoms every morning since they have started booming this year. They are peppery and the small thorn hairs do effect the mouth when raw. 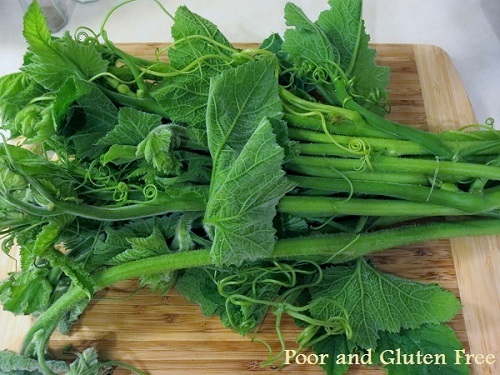 I think you could treat the stems as you would nettle or even kale and steam them in broth and serve over rice. I've seen the blossoms at the farmers market and always tell myself I'll get some next time, but haven't yet ;) One of these days I will! And yes, I agree, I think you could steam the stems too and they'd probably be great. I sauté squash leaves all the time. Sometimes I add peanut butter or fresh cream and serve with pap meal.....A corn thick porridge. I come from Zimbabwe where pumpkin leaves are a delicacy. Really yummy and easy to prepare. Tip is to pick not so old leaves, wash thoroughly and always peel off the pricky skin (peeps off easily). Oooh, peanut butter and/or cream and porridge sounds amazing! I'd love to try that, thanks for sharing, Patience (and the tip about peeling)! I've made these into soup in previous years, using a spinach soup recipe. Although the lack of the spinach's characteristic oxalic acid should be a bonus, the result seemed a little bland - so your recipes are a great find. I've also used them instead of traditional kale etc in Gwyneth Paltrow's Green Rice recipe: steamed (or cooked in a wok with just their residual rinsing water) and added to 2 cloves of garlic and (3 large spring) onions, chopped finely and sauted in a little vegetable oil, plus 175g brown rice, cooked and then stirred in, along with 1.5 tbsp soya sauce and the greens. My courgette plants have been spending too much energy growing leaves, so I had a whole sack full of good leaves, even after cutting off the scratchy stems (which a friend wanted for making bee house tubes) and the thick leaf ribs. I may have to use several of your recipes to use them all up, even now they've been reduced in bulk by cooking and chopping. Just what I was looking for. it has rained to much these past few months to get many squash but we have a lot of leaves. thanks. 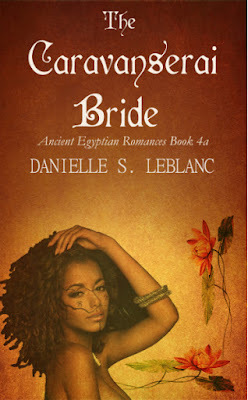 What a joy to discover your blog and all those links to other sites. 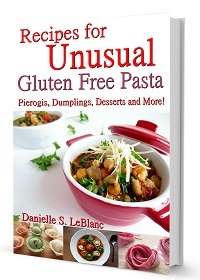 I hope you enjoy some of the recipes! I had no idea they were edible either until I saw a bucket of them at the farmers market and had to give them a try ;) Now I'm always on the lookout for them! I found your blog when I was searching to see if anyone else was sensitive to squash plants. I have blue hubbards and yellow summer squash varieties and when I harvested a couple of the yellows, I got HUGE hives on my arm. I thought they were bites, but they went away that same evening. They were terribly itchy. Anyway, thanks for the article on using the squash leaves, it is interesting. Thank you! I bought some squash blossoms at the farmer's market this morning, and realized that I had never given any thought to using the stems. I was thinking of putting them in with other vegetable trimming for broth, but now that I've read this post I am going to chop them up and slow-cook them with a handful of onion. Thank you for all the info about squash leaves. I habe two plants on my balcony and they seem to grow hundreds of leaves. Really hope I will get at least one courgette in the end ;-). Oooh, I love Indian cooking, and have a very large bag of turmeric in my cupboard right now! Thanks for sharing, Mukta! In the Philippines squash leaves are cooked together with the squash itself. 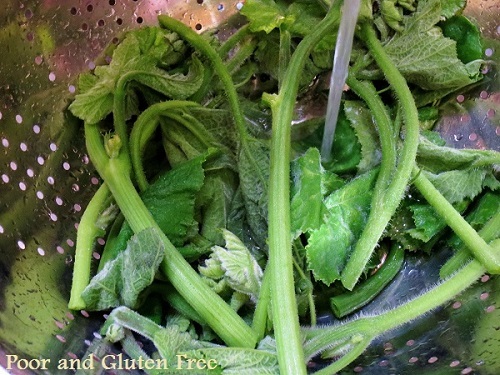 Squash is cubed, leaves and stems prepared as you have mentioned. Garlic, onions, and a teaspoon of sliced ginger are sauteed in pork fat (or olive oil as I do it here in NY), followed by halved fresh shrimps, and cubed aquash. When cooked, squash leaves are added, then 1-2 cups of rice water or chicken stock. Season with sea salt and freshly ground black pepper. Let boil then quickly remove from fire to maintain leaves' greenness. Best eaten with fried fish or breaded pork chops and steamed rice. Not only delicious, but nutritious. Think of vit A in the yellow squas and the nurients from the green tops. And very appetizing because of color combination. Try it. You'll love it. I'm from Brazil and my mom (part Italian) used to cook pumpkin shoots along with the young leaves by finely chopping them, adding some salt and pepper then sautéing in oil and garlic for about 5-6min and serve with polenta! Delicious!! I had no idea as well! I jave plantwd squash this year, the leaves and stems are so big, so it made me wonder if we can eat them. I fot this site on Google. Thanks for all the great info. My family and i will be eating more yummy greens in our diet! I touched the hairy stem,kind of prick my skin,ouch,suddenly afew days later both my hand,leg,body feeling so itchy for a week plus till today. How to stop this itch,what medication to use,, please help,,thank you. Wow, are you sure you're still reacting to the squash after all this time? You should check with your doctor if you're having such a severe, prolonged reaction. Otherwise, I avoid skin contact with the leaves and stems, and for immediate reactions I take Allegra for allergies (others like Benadryl, too), and I have a Benadryl cream to rub on my skin for itchy reactions (also for bug bites). I hope that helps! I juiced them with my other greens..did not go well...i became very nauseous and sick. Oh no! I don't think I've seen any recipes that call for them raw, and personally I wouldn't do it because I react so strongly to touching them, but thanks for the warning! I hope you're feeling better now. Thanks for sharing that. That skin really does seem to be a problem for people! I'm sorry to hear that! I hope you were able to get some relief. It's a terrible feeling!! Great tip! Thanks, Jamie Lynn. I have been making a beautiful green soup of them all week after learning I COULD from your site. 8 zucchini leaves and stems, one potato, one chopped onion, 3 garlic cloves, 2 T evoo,1 tap salt, 1 cup broth, saute then simmer 30 mins. Blend. Serve with lime or lemon juice, fresh grated parmesan and fresh ground pepper to taste. Better than expected. Even the kids and finicky husband love it! Pan fried with bacon; or boiled with pork.